Brand new two-bedroom two-bathroom north-facing apartment in newly built 51 Battery Point complex. 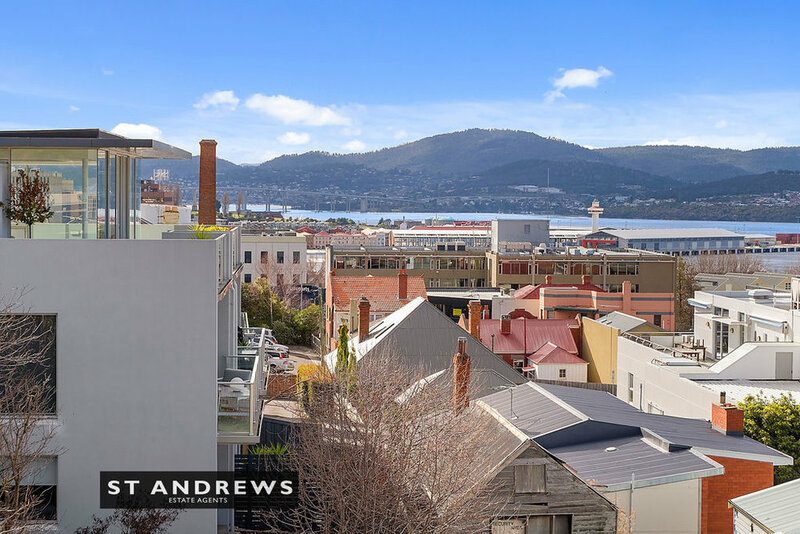 This top-level corner apartment designed by JAWS Architects features superb elevated unimpeded views toward the City, Sullivan’s Cove/Salamanca and Battery Point. Comprising a free-flowing open plan living-kitchen-dining area spilling out onto a full-length tiled deck, two double bedrooms (master with study nook and ensuite), second bathroom and euro-laundry. This never before occupied apartment features stone kitchen bench-tops and full height splash backs, Bosch appliances plus Mitsubishi refrigerator/freezer, reverse cycle heating-cooling, double glazing, Italian bathroom tiles, floor to ceiling living room windows/sliding door, lift access, LED lighting and its own car space on title.